A Kid at Art For the Heart(tm) is a 501c (3) non-profit organization offering underserved and disadvantaged preschool children innovative, community-responsive art education. 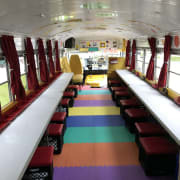 Our inspiration-on-the-move programming is delivered to the doorsteps of schools and human service organizations throughout Geauga and Lake Counties in a fun and colorful, fully-equipped mobile classroom. In collaboration with each sponsoring organization, A Kid at Art For the Heart (tm) custom designs innovative multimedia learning solutions to meet specific community needs. We are looking for assistance on the bus during classroom time as an extra set of hands and an opportunity to work hands-on with the children, as well as help with fundraising opportunities. Times are flexible. On the bus, assistance is needed September through May. Fundraising is needed year round. Must be friendly, like children and flexible.